Because of the late boarding, the business class cabin was mobbed quickly. It’s a 2-3-2 configuration for regional business class on this Boeing 777. The seats are perfectly comfortable, but for a flight that can approach 5 hours, it’d be nice to have something lie flat for sleeping. There were pillows and headphones at the seat, and then they came around offering blankets, pre-departure beverages, and hot towels. I’m not really sure who wants hot towels leaving Bali, so I asked for a cold towel, and they offered me a not-hot (but not cold) towel a few minutes later. The IFE screen for these seats is a little small and blurry. There’s a USB port and electrical outlet for charging devices. There’s limited storage at these seats: there’s not really any underseat storage, but there is a small slim pocket in the center between seats. After takeoff, they offered drinks and mixed nuts to start. Then came the meal service. For my Jain vegetarian special meal, the starter was some sort of cold bean puree with black eyed peas on top. It reminded me a little bit of hummus, and was a large step up from plain cold vegetables that are usually served as vegetarian special meal appetizers. For my main, I had chickpea curry, rice, spinach, peas, and cabbage. This was pretty delicious. Finally, I had a fruit plate to finish off the meal. Overall, this was a pretty good VJML. The service was not particularly personable, but it was very efficient. There were Jurlique products in the bathroom, but no amenities were offered. This entry was posted in Cathay Pacific, Travel, Trip Reports and tagged business class, cathay pacific, flight review, travel, trip report, vjml on February 19, 2018 by Edward. My final destination for this trip was Penang, Malaysia, so I connected to Dragonair (now called Cathay Dragon) in Hong Kong. The business class cabin was completely full for this flight, and I think the economy class cabin was almost completely full as well. This was a flight with a regional business class configuration, so nothing fancy, but the seat is pretty comfortable with good legroom. This isn’t a good seat for sleeping, though, since it doesn’t recline that much. They were serving pre-departure beverages of water, fresh orange juice, or a cocktail of passionfruit and gin. There were already headphones at every seat. Instead of a wet towel, they provided antiseptic packaged towels. Now, it had been a couple of years since I had last flown Dragonair before this flight, and one of the things that I remembered loving about Dragonair was the canned Hong Kong style milk tea that they had. Unfortunately, they no longer carried the drink. I had pre-ordered a special VJML (Jain vegetarian meal) for this flight. The starter consisted of cold chickpeas, peas, and kidney beans. They were served plain, which was fine, since I was happy that there was at least some protein in the vegetarian meal. My seat mate had the typical starter of smoked duck breast, and graciously allowed me to photograph his meal. For the VJML entree, it was a pretty tasty combo of lentil curry, rice, and peas and cauliflower. My seat mate had the angel hair pasta with mixed seafood in a cream sauce and vegetables, and he seemed to enjoy it. Overall, I think I’ve had better special meal catering on Dragonair than Cathay Pacific, but the regional business class product is largely identical. I think there are small differences like the fact that Cathay Pacific uses hot towels while Cathay Dragon uses the packaged towel wipes, and you unfortunately can’t add Cathay Dragon on an Alaska award, but otherwise, they’re pretty darn similar products. This entry was posted in Dragonair, Travel, Trip Reports and tagged business class, cathay dragon, dragonair, flight review, special meal, travel, trip report, vjml on June 2, 2017 by Edward. On most flights, I typically like to sit on the right-hand side of the aircraft, but in Cathay Pacific first class, the seats on the left (1A and 2A) are more private since the center seats open up to the right-hand aisle. So on this flight, I had selected seat 1A. I will say that it seems like the flight crew defaults to using the left-hand aisle to pass through the cabin so as to disturb fewer passengers, so there is slightly more foot traffic on the left-hand side. Cathay Pacific doesn’t have overhead bins in the first class cabin, so it feels more spacious. Instead of overhead bins, there are lockers at every seat for you to store your belongings. I was soon offered a pre-departure beverage of water, juice or champagne. I was also offered an amuse bouche of prosciutto and cauliflower, but I asked if they had a vegetarian option instead since I had requested a vegetarian meal. The flight attendant scrounged around for a bit and brought me a flaky pastry filled with hummus, an olive, and marinated sun-dried tomato instead. 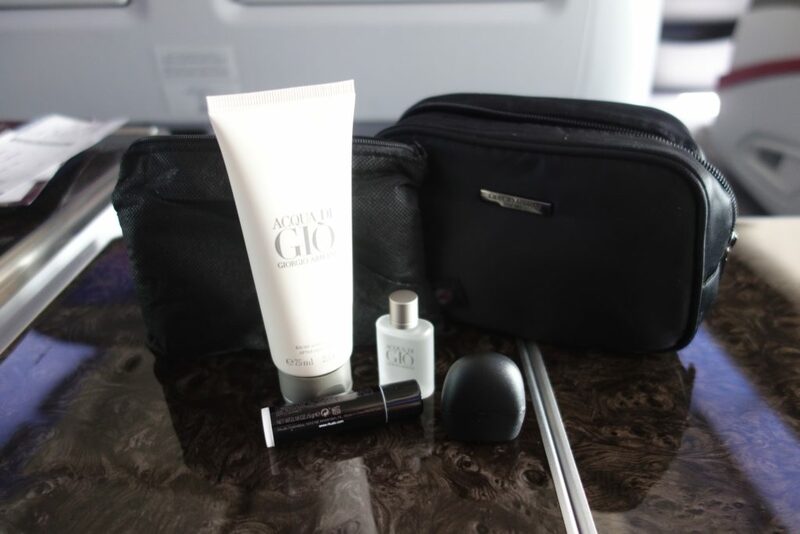 I was then given Bose headphones, PYE pajamas, and an amenity kit (I requested the female one to give to my sister since I already had several of the male amenity kits). For this flight, I had pre-ordered a special VJML (Jain vegetarian meal). I was still provided a menu and wine list for the flight, and I was told that I could order off the menu after the flight attendant asked the other passengers for their selections. After takeoff, I was given warm cashews and almonds to start. I ordered a Cathay delight to drink. I started my meal service off with the caviar service. I prefer blinis to toast, and I like the spoon that Cathay uses, which makes Cathay’s caviar service one of my favorites. I was also offered an entire warmed breadbasket, although there was no handwritten card. I next had a soup of white asparagus with some freshly ground black pepper. If you like soup and asparagus, then it was pretty tasty. The salad that I was served was the salad off the menu without the lobster. It was a little odd to eat without the lobster, since the salad was mostly just frisee otherwise, but I could imagine that it would be good with lobster. My VJML entree was not very good. There were cut green beans and cauliflower in a brown sauce. I wish there had been lentils or chickpeas or something with more protein. The fresh berries in rose syrup, though, made up for my sub-par entree. And since I’m a glutton, I also tried the pistachio cake with ice cream. A little too sweet for my tastes, but still good. After dinner, I went to the bathroom to brush my teeth, and when I got back to my seat, the bed had already been made. In general, I found the service on this flight to be good and proficient, but maybe not quite as personable or memorable as crews I’ve had on the past on Cathay Pacific. One benefit of the departure time of this flight is that I found it easy to sleep. I slept soundly for about 9 hours, and I find the Cathay Pacific seat and bed to be one of my favorite hard products. It’s nice and wide, and the bedding is comfortable. For breakfast, I started with a fruit plate that was pretty delicious. I also ordered some earl grey tea which came pre-steeped. The VJML pre-arrival meal was way better than dinner. It consisted of okra, cauliflower, potatoes, and peas in a spicy and flavorful sauce. Overall, this was a solid flight on Cathay Pacific. It’s one of my favorite hard products for sleeping, and I felt that the service was pretty good. This entry was posted in Cathay Pacific, Travel, Trip Reports and tagged cathay pacific, first class, flight review, special meal, travel, trip report, vjml on June 1, 2017 by Edward.